Environmentalists say leaders at June’s Rio+20 summit must urgently step up nature protection, as a report confirms a 30% decline in wildlife since 1970. The Living Planet Report combines data on more than 9,000 populations of animals across the world. Rio+20 is billed as a chance for world leaders to put global society on a sustainable path. But the report’s main authors, WWF, say progress on nature protection and climate change is “glacial”. “The Rio+20 conference is an opportunity for the world to get serious about the need for development to be made sustainable,” said David Nussbaum, CEO of WWF-UK. The Living Planet Report uses data on trends seen in various species across the world, compiled by the Zoological Society of London (ZSL). Further analysis from the Global Footprint Network aims to calculate how sustainable our global society is in terms of its overall ecological footprint – a composite measure of issues such as fossil fuel burning, use of cropland to grow food, and consumption of wood and wild-caught fish. For this edition of the report, ZSL has examined more species (2,600) and more populations of those species (9,014) than ever before. 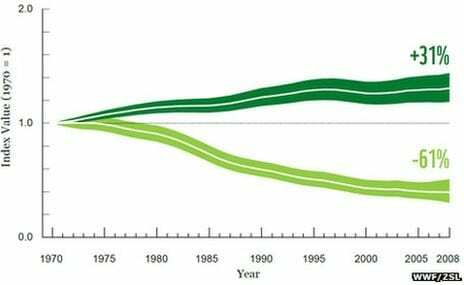 Overall, these populations show a decline of about 30% since 1970 – the same figure as in the last edition, published two years ago. Tropical species show a decline of more than 60%, while in temperate regions there has been an average recovery of about 30%. The worst affected species are those in tropical lakes rivers, whose numbers have fallen by 70% since 1970.